There is something about ‘handmade’ that goes so well with Christmas. Perhaps it’s the thought of all those elves in Lapland busy making toys… how do they do it? Best of all, it offers the perfect excuse for anyone with a crafty inclination, to make something a bit magical. Last weekend I stumbled upon a contemporary craft fair in Angel Islington. There were some really beautiful handmade gifts on offer and it was great to see so many people supporting their local community. Some of these Christmas markets can be a bit hit and miss and who knows where some of the stuff comes from, but if you can find events where artisans are selling their work directly, you can come across really unique items, unmatched by the high street. In this post however, I’m delving into the online world of Etsy. There is such a wealth of handcrafted items for sale on Etsy that there is rather a lot to trawl through to get to the good stuff. So, if there are no craft fairs in your vicinity, I hope this handpicked selection of Etsy shops proves to be a good guide when hunting for Christmas decorations from the comfort of your sofa. In the spirit of reducing impact, these are also some of the best Etsy shops I could find for upcycled, vintage or decorations made from natural or recyclable materials. 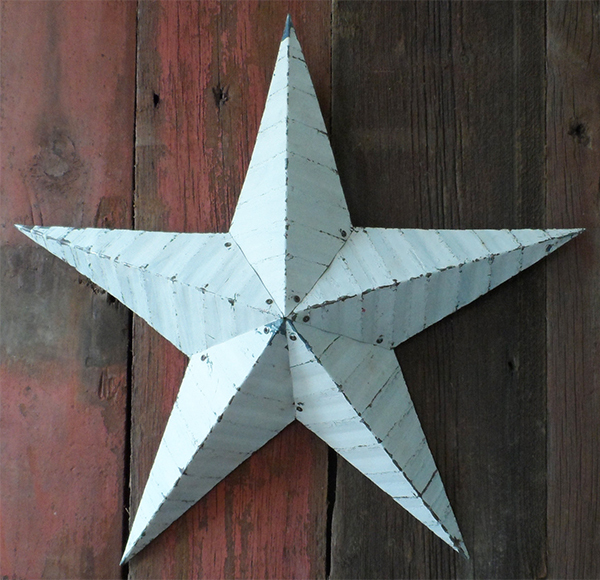 Good for: Amish Barn Stars, imported from the Amish community in Philadelphia, along with other vintage items sourced from the USA and Europe. The tradition of making stars out of recycled tin roofs goes back hundreds of years and each colour is said to have its own particular meaning. For example, blue represents protection, peace, calmness and spirituality whereas green symbolises growth, fertility, and ideas that flourish to success. Perfect for rustic, vintage or Scandi interiors. Prop one up against a wall or on a mantelpiece and drape in white fairy lights. 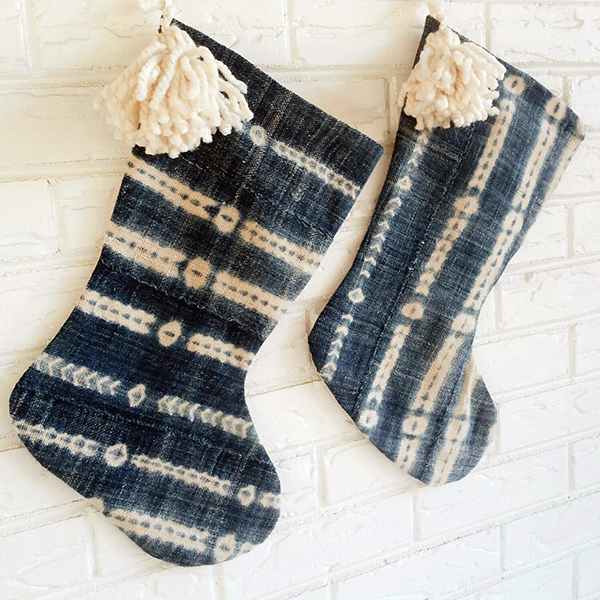 Good for: Boho style Christmas stockings made from upcycled vintage fabrics. The stockings are made from vintage mudcloth from Mali, vintage Kantha quilt from India as well as upcycled burlap from repurposed coffee sacks. These would make a nice addition to a farmhouse, rustic or bohemian style interior. 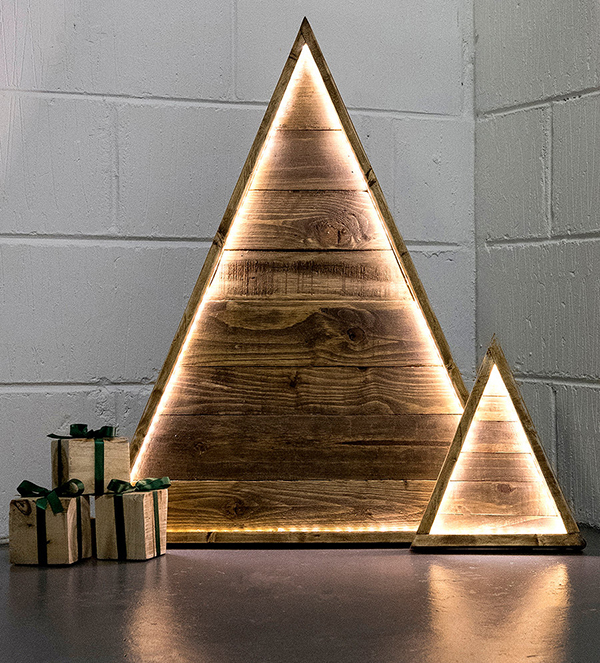 Good for: Reclaimed pallet wood Christmas trees and frames. 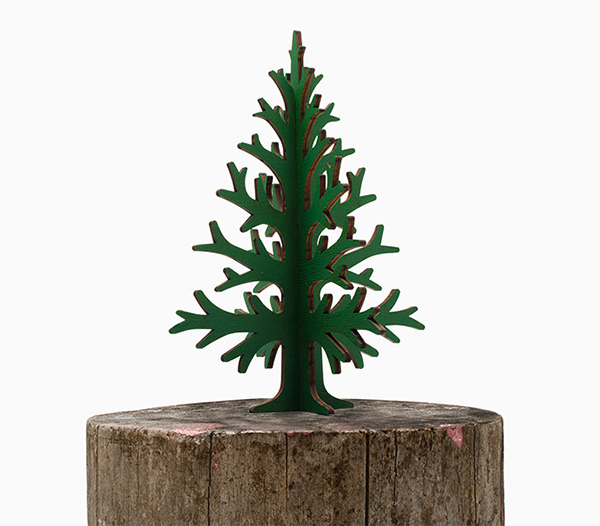 The design is great for small spaces that won’t accommodate a real tree. So simple you could probably use it all year round! 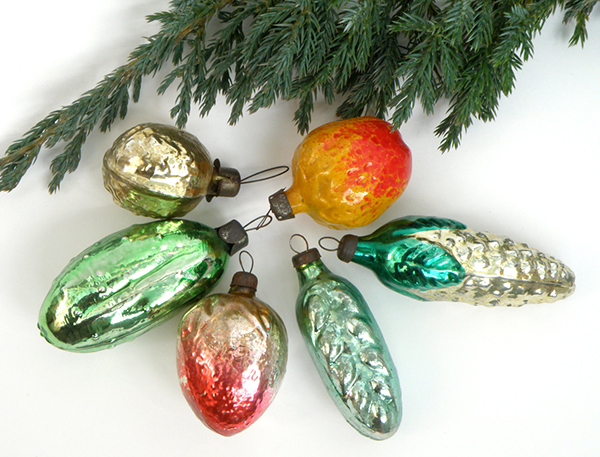 Good for: Vintage soviet ornaments dating back to the 1960 and 1970s. With hundreds to choose from, you can whittle away hours looking through all these wonderfully kitsch decorations. The collection includes astronauts, space ships, figurines and vegetables, most of which are made from mercury glass. Pictured is a set of vegetable ornaments, including a strawberry, pomegranate, cucumber, walnut, pine cone and ear of wheat from the 1970s. They’d look very at home in an eclectic mid-century, vintage filled interior. 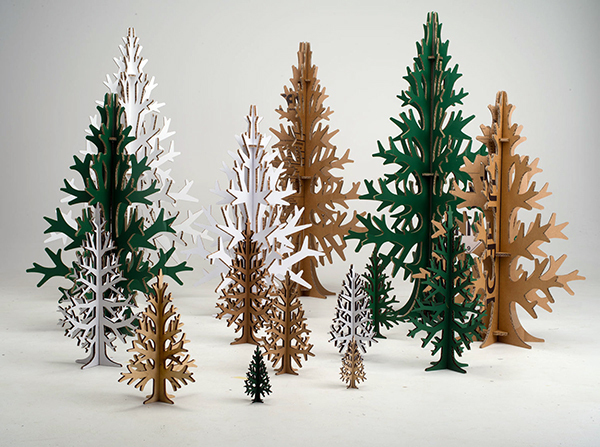 Good for: Christmas trees made from recycled and recyclable card. They come in a variety of colours and sizes (including pocket size – literally) and can be easily dismantled and stored flat at the end of the season. 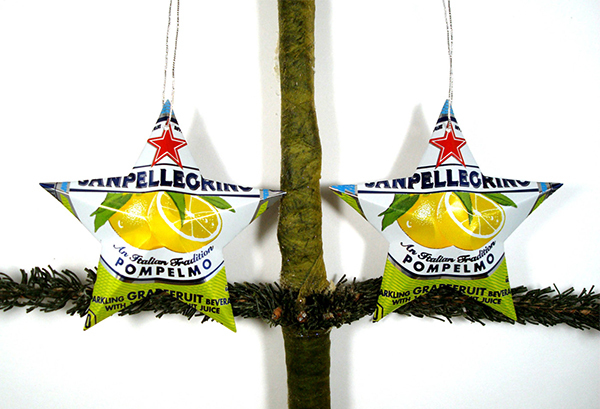 Good for: Stars made from upcycled beer and soda cans. Style palette: Tropical themed Christmas decor. Stuck for ideas? In this tutorial from Brit + Co, you can learn how to make pineapple ornaments from pine cones. Well why not? Good for: Handmade wreaths made from real dried flowers. The wreaths are for indoor use only, but it will last for years if kept out of sunlight. 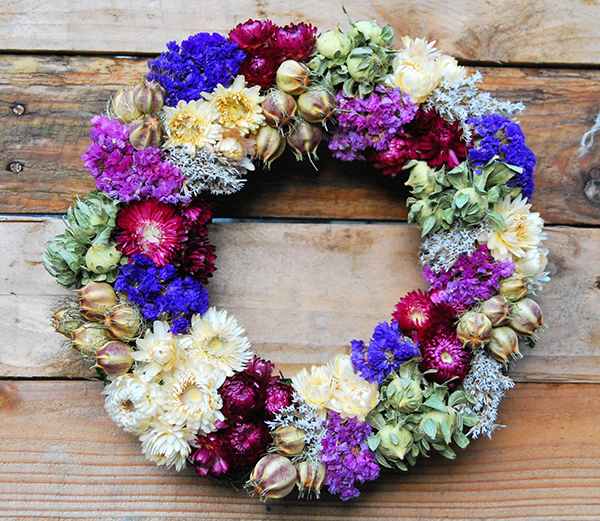 The wreath above includes dried helichrysum, statice and carmanthus. Hang over a mirror, the back of a door, or directly on the wall. 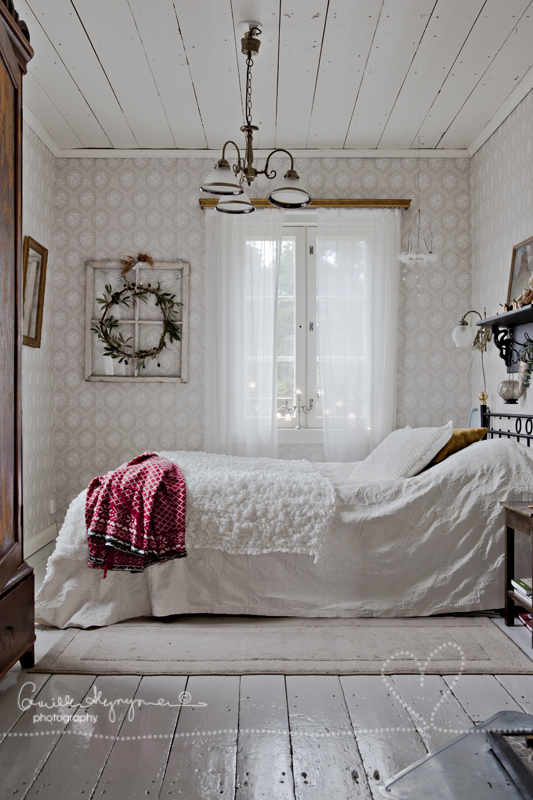 Check out how Swedish blogger Lilla Kamomilla styled her wreath over an old window in this beautiful bedroom – a lovely detail for a bohemian or rustic style home. Good for: Sustainably harvested natural wood trees that can be used year after year. The tree comes in two sizes and is a great reusable option that can be disassembled and stored in a bag at the end of the season. Perfect for a Scandi or Mid-century style interior. Good for: Scented soy candles made with essential oils. For those who love their home clean, calm and uncluttered. 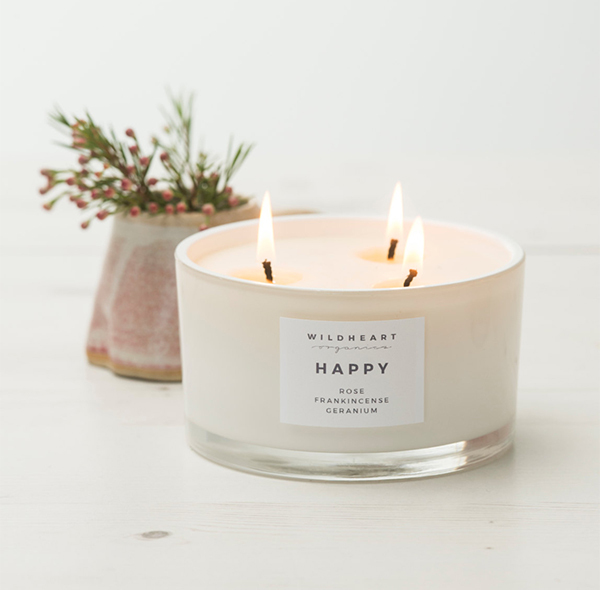 These candles are guaranteed to create an air of tranquility (and an escape from the Christmas madness). Emma Holt started making her aromatherapy candles from a barn in Edinburgh after being introduced to essential oils at an eco hotel. The candles are designed to help you sleep, de-stress and nourish the soul. 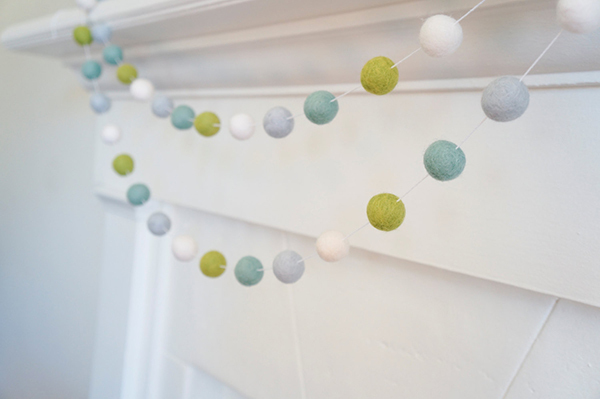 Good for: Natural wool felted ball garlands made from sheep wool sourced from New Zealand. Each ball has been hand rolled and hand dyed in a wide range of colours. 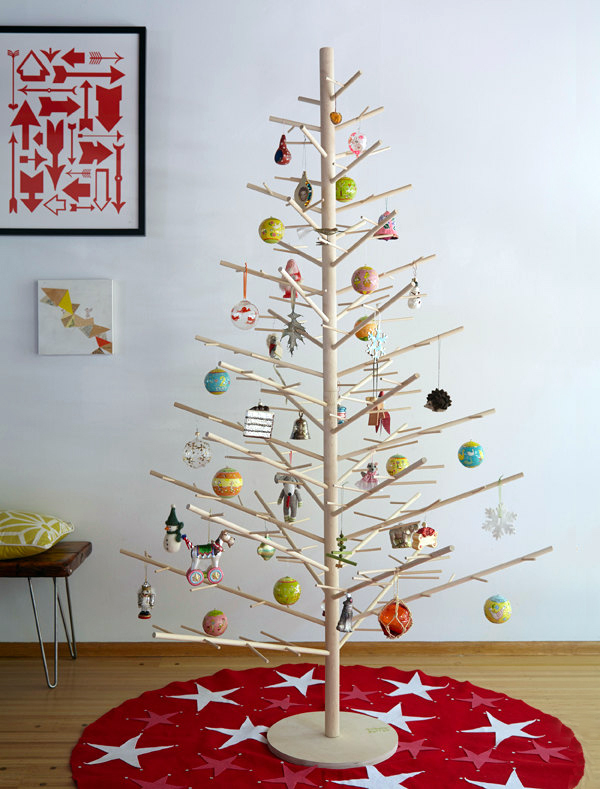 A fun, playful addition to a living room or kids bedroom, all year round. Good for: Crocheted Christmas decorations made from bamboo, British sheep wool and organic cotton. 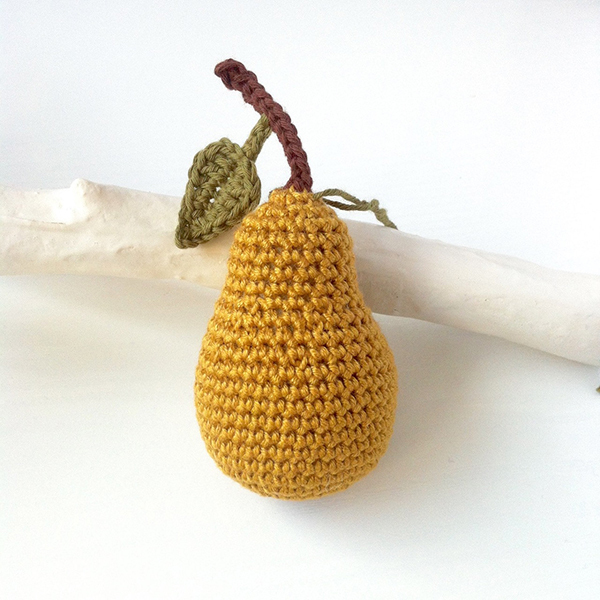 And if you’re also into crocheting, the shop owner, Clare, sells patterns and kits for making your own. Printed on recycled paper, the patterns contain all the information needed to choose appropriate yarn, stuffing and crochet hook, and is packed with colour photos to make every step as clear as possible. 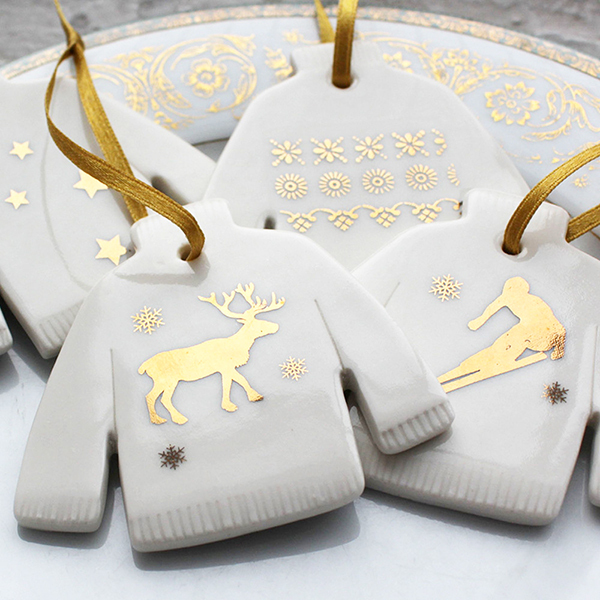 Good for: Christmas decorations made from porcelain. Jo Heckett is a writer, ceramicist and cook currently training at Le Cordon Bleu. She says her studio could quite easily be mistaken for a bakery as the techniques she uses to make her fine porcelain decorations are similar to that of making biscuits. In addition to her Christmas jumper design, she makes snowflakes, bells, trees and mittens, some of which are stamped with vintage and found objects to create patterns. 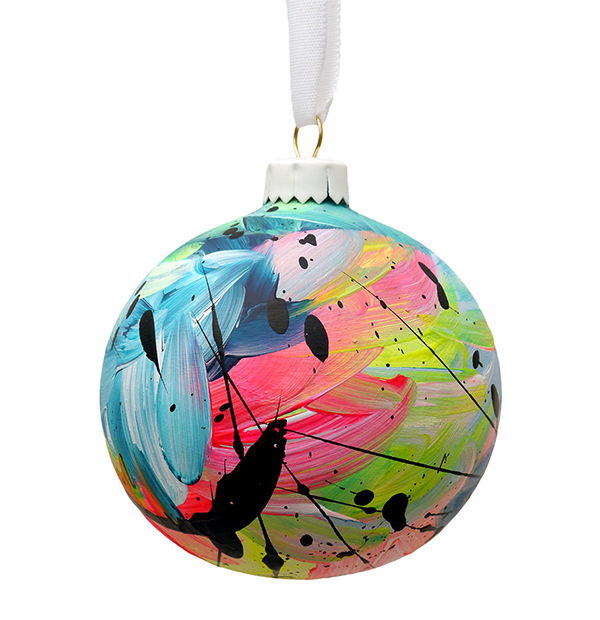 Good for: Contemporary hand-painted ceramic baubles in bold splashes of colour. Endorsed by Living Etc, The Guardian and the Royal College of Art, each Christmas decoration is a work of art and is signed, dated and numbered accordingly. Definitely a vibrant alternative to traditional metallics and jewel colours. Good for: Delicate white porcelain ornaments and jewellery. 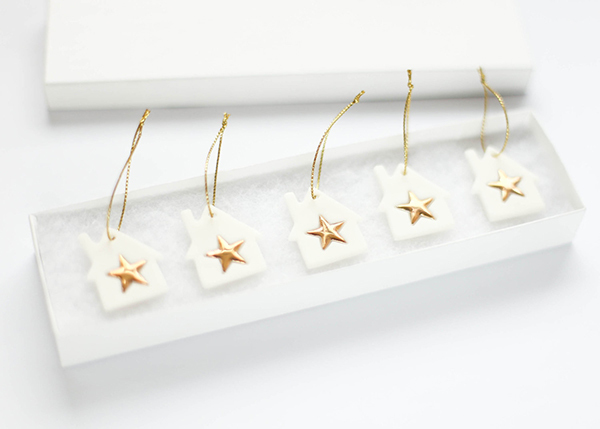 These little houses with gold stars are made from a matt self glazing clay by design duo Delphine and Max. Their collection mainly consists of unique designs made from porcelain, all of which would make beautiful one-of-a-kind gifts, particularly if you know any custard cream lovers. With the endless amount of talent on Etsy, this list could go on indefinitely, but it’s probable that Christmas will be over by then, so I’ll have to save them for next year. And if you have any of your own favourite Etsy shops for all things Christmas related, please feel free to share them with us!